A coalition of grassroots groups took to the streets on Friday to alert their neighbors and warn local politicians against selling out the Bronx. 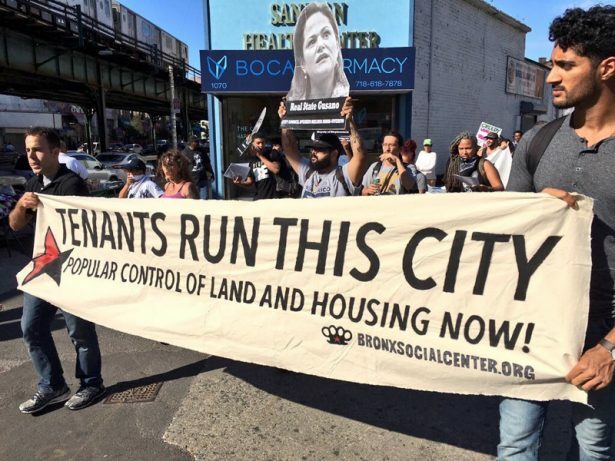 A coalition of grassroots groups marched in the Hunts Point neighborhood of the Bronx on Friday, alerting their neighbors to the gentrification plans of developers and local politicians. They were also sending a message to those local politicians, telling them not to not sell out the Bronx, while also calling for community control over land and housing. The groups and residents involved in the march — which included Take Back The Bronx, Mothers on the Move and People Power Movement — are particularly concerned with plans to rezone Southern Boulevard. Their march was intended as a rallying cry to get local residents to unite and fight against these plans. According to a report released in March from the Regional Plan Association, Bronxites are at the highest risk of being displaced in New York City — with 71 percent of Bronx households in danger of displacement. Plans to rezone parts of the Bronx, which would allow wealthier developments to be built in poor and working-class areas, are supported by local politicians like City Councilmember Rafael Salamanca, Jr. and Bronx Borough President Ruben Diaz, Jr., as well as Mayor Bill de Blasio. With the rezoning of Jerome Avenue in the west already in the works and politicians openly eyeing Southern Boulevard in the east for rezoning, the groups at the march wanted to begin organizing against the Southern Boulevard rezoning plan while the plan is still in its infancy. Councilmember Salamanca has stated that he sees the Southern Boulevard rezoning plan as an opportunity to attract investment in the area that would benefit the community. Meanwhile, according to a recent analysis by City Limits, Salamanca accepted $6,175 in donations from people affiliated with the real estate industry. Many of the activist groups at Friday’s march have also accused Salamanca of having secret meetings on the rezoning where the public was not invited. The march started at Hunts Point Plaza before it made its way to Salamanca’s office. A banner with the words “Take Back The Hood” led the march as participants chanted “Salamanca! Salamanca! We won’t let you sell us out! If you try to gentrify, we’ll give you something to cry about!” From the start of the march up to the point they approached Salamanca’s offices, police made things difficult for the march, following and pestered protesters over use of a speaker and a megaphone, as well as trying to keep protesters away from the front door of the offices. 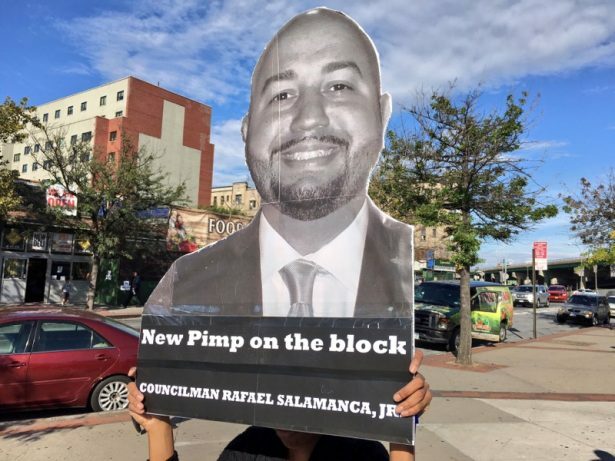 Along with Councilmember Salamanca, Bronx President Diaz and Mayor de Blasio, the protesters also called out Deputy Mayor for Housing and Economic Development Alicia Glen and City Council Speaker Melissa Mark-Viverito as corrupt politicians who enable gentrification. 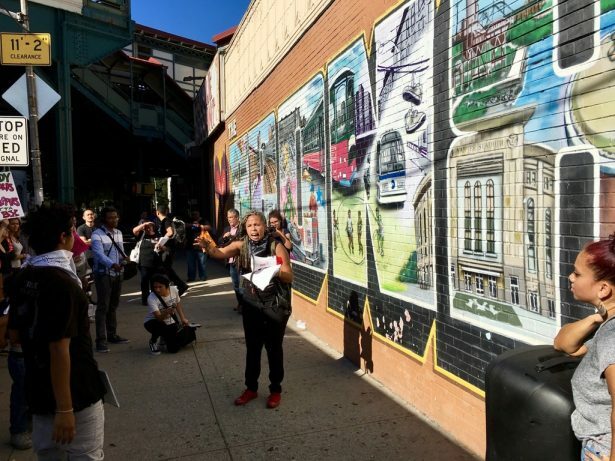 The march then made its way to the “I Heart The Bronx” mural — made by graffiti legends Tats Cru — where Rodriguez spoke about the commodification of Bronx culture and history for the purpose of attracting tourists and gentrifiers, while displacing the very people who created that culture. The march then arrived at some new developments being built on nearby Simpson Street, before heading back to Hunts Point Plaza, where the march ended and participants took the streets — all while being trailed by police. A study released in June by the Association of Housing and Development showed that affordable housing is under threat in the Bronx with the Jerome Avenue and Southern Boulevard areas topping the list. For Take Back The Bronx, the solution to the problem is community control.